Fine living awaits you in this Estate Pool Home with an exquisite setting behind the Blue Tees of the 17th Fairway and Lake. Long Vistas and sweeping sky views from the Pool and Lanai. This 3 bedroom Home with Den boasting double door entry, hardwood floors throughout the main living areas of the home, crown molding, and sliders from the living room to the pool, formal dining area, Large Master Suite overlooking the pool with its own sliders for entry and an updated Master Bath, and great closet space. Well equipped kitchen with serving window to the lanai and pool, Kitchen bar area and additional eating space. Family room is light and bright with vistas to the 17th hole. Guest rooms offer privacy and space along with an updated 2nd bath, Large Den with hardwood floors and great built-ins, additional half bath for guests. Oversized, side load garage gives extra space for all those extras. Lovely Palms adorn the driveway entry and street view of this exquisite setting. 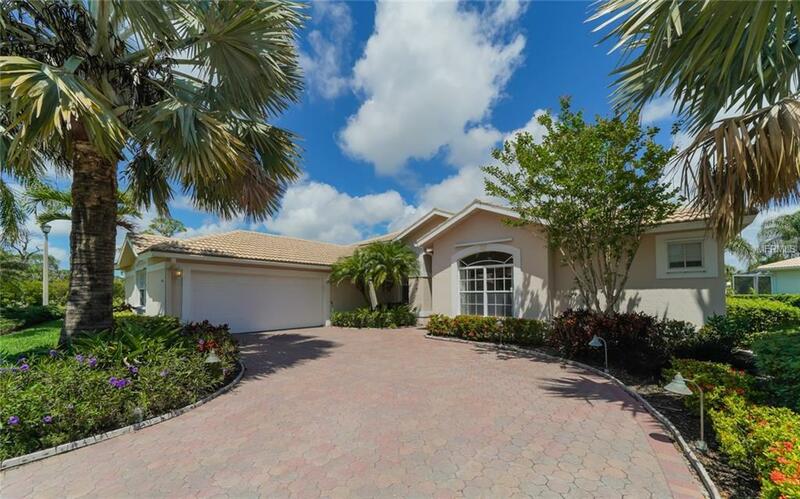 A premier equity-owned country club, Stoneybrook of Sarasota is only a short distance from Siesta Key, very easy access to shopping, and the development borders the Legacy Bike Trail. Ownership in Stoneybrook includes recently remodeled clubhouse and restaurant, 18- hole Arthur Hills design course, Har-Tru tennis facility, freshly equipped fitness center, and club pool.